Impact of the Large Synoptic Survey Telescope on mission planning? So, the LSST has been progressing according to schedule and the first light should happen next year. As an 8.4m telescope that will cover the entire sky every three days due to its large field of vision, it's expected to increase the number of catalogued small objects by a factor of 10 to 100. It would be interesting to see how this impacts mission planning. On one hand, it makes it easier to find targets for asteroid capture similar to the ARM. Alternatively, it could provide targets to visit with the SpaceX starship as they zip through the Earth moon system. And of course, less relevant to this sub-board but still interesting, it will discover a wide range of Kuiper belt objects and possibly planet nine. Re: Impact of the Large Synoptic Survey Telescope on mission planning? Great news. We need more info on the smaller rocks. Doesn't the atmosphere filter out infrared? I am still of the opinion the NEOCam as proposed by Amy Mainzer is needed to get a good inventory of potential city killers and possible asteroid mining targets. Especially the apoheles. Those rocks with a an aphelion < 1 A.U. are especially hard to see for ground based scopes. 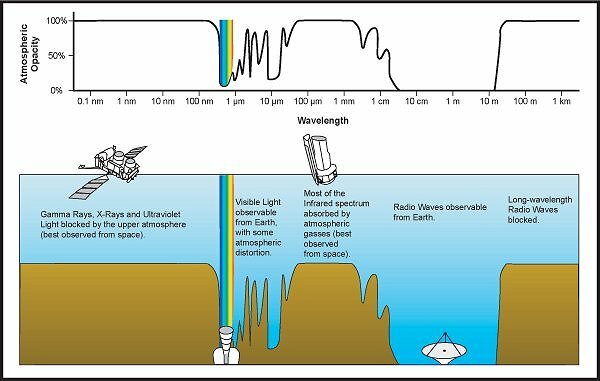 Most of the infrared spectrum is absorbed by the atmosphere, yes. Right, it's not going to be as good at seeing infrared as anything in space, but it's going to be built on a tall mountain in Chile with excellent seeing & extremely dry air, and due to its larger size it's going to be an order of magnitude improvement over Pan-STARRS. Being able to cover the entire sky every three days means it'll be better at finding moving objects in the visible light spectrum than basically anything else so far. It would be fun to speculate on what future telescopes of this kind could be built with BFR though. The BFR has a large enough diameter to put this kind of telescope in space. With a bit of in space assembly, it would be fun to imagine a design similar to GAIA, but with a pair of LSST mirrors instead of those tiny rectangular mirrors. Being able to put monolithic 10 m telescopes in space will be a massive gamechanger. Another factor: It's possible to get scopes very cold at SEL1 or SEL2. A scope in low earth orbit has nearly half the sky filled with a 300 K heat source. Amy Mainzer's scope had infrared as well as higher wavelengths. By simultaneously measuring heat as well as visible light reflected, we could get a good handle on an asteroid's albedo. And from that we could estimate size with some accuracy. Regarding your noting Musk's HLV could launch a big scope -- I hadn't thought of that. A space scope with huge mirrors as well as huge CCD arrays would be a major game changer I would think. Even with Musk's Starship, are people really gonna still stick with obscenely huge monolithic mirrors though? The expense involved is terrifying due to so much NRE, compared to splitting the risk with semi-mass produced mirror segments. JWST has shown a path to segmented space mirrors, and a Starship hauling a boatload of segments is comparatively easy. Assembling on orbit from basic building blocks seems to be the probable basic form of telescope creation from now on, unless you are actually making mirrors in space. AFAIK No one have assembled any telescope with separate segment pieces in orbit yet. Until someone assembled one successfully, monolithic mirror or deployable mirror segment telescopes seems a better choice to get funding. One big issue is they aren't marvellous for asteroid hunting as their view of the ecliptic is poor. I don't think so, not even if mirrors are made in space. Nowadays even on Earth, where it's easier to transport large monolithic mirrors, large telescopes use segmented mirrors. Re the OP, the LSST should find more 'Oumuamuas, sooner or later providing enough warning time for comprehensive pre-perihelion observations. If it doesn't, that will be interesting too. Large monolithic mirrors have better wave front quality than segmented mirrors due to diffraction off the edges. This is why the Large Magellan Telescope uses seven 8 meter round mirrors. You want the most mirror area with the least amount of edge. This is especially important if you are using an occulter to block the central star light to try and image extra solar planets. Large monolithic mirrors give the best image quality and are preferred if you can manage them. All perfectly true, yet the LMT's designers chose a multi-mirror design despite its sub-optimal performance from a purely optical perspective (if "optical perspective" isn't too redundant!). There's a trade-off between optical performance and concerns of engineering and cost. The trade will no doubt be different in space, but it will still be there. A path that makes gold look inexpensive. The whole moving assembly in LSST weighs 200 tons, and is if I'm understanding the budgetary numbers correctly $200M. A significant part of the cost of this optical system is as I understand it the adaptive optics. I note the actual camera is in vacuum. The optical assembly is already designed for 3.5G random acceleration undamaged, and up to 5.5G easily repairable. (Due to it being in an earthquake zone). Previously, Elon has given the capability of an expended BFS at 300 tons (expending the booster). Even at $300M launch cost, a total of ~$500M for an orbital 8m LSST size scope. It seems likely that it could be modestly lightened (most of the mass is in support structure designed to keep it rigid under 1G, and launched without expending a BFS/Starship, for considerably less. Meanwhile, JWST is going to likely meet $10B. (and most of this cost is not the instruments). Dust will be issue, more so once we increase our activity on moon. No adaptive optics in LSST. It's a survey telescope designed for wide field of view.